We don’t need everyone to code. But we do need people to understand how Computers work and how to use them effectively. 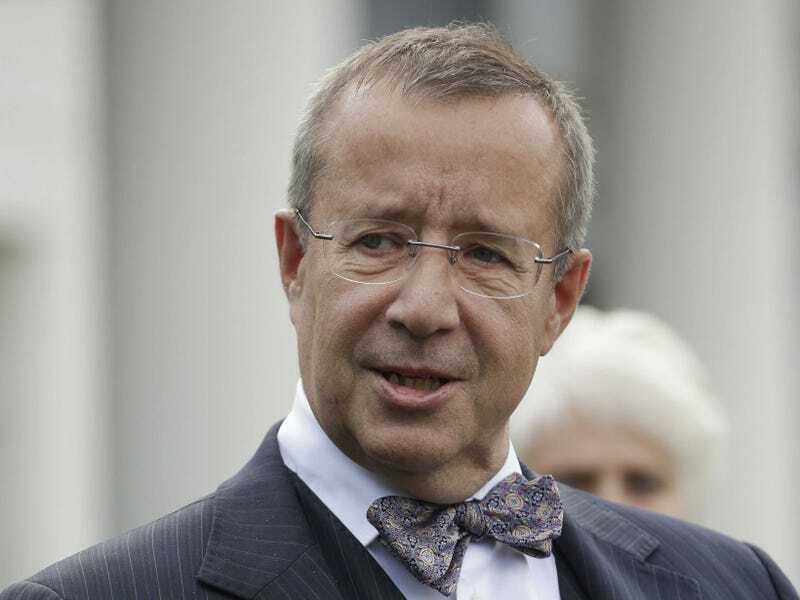 For example, We need people who understand how to search for patterns in the noise of millions of database records, efficiently. How to configure and performance tune a web server so it can serve photographs of people enjoying themselves. And definitely make sure servers aren’t full of security holes – which are usually left open by sloppy programmers. Code is often not the final destination in Computing. The valuable end product is often not the code but the data it subsequently produces and increasingly in large volumes aka big data. Being able to understand, manipulate and secure it is important and that’s not always the same thing as programming. We are all taught from a young age to use a fork and knife, but not all of us will be surgeons. I know, it’s a lazy extrapolation (and I’m certainly not saying programmers are the surgeons of Computing – that’s UI designers for me 😉 but you get the jist. Computing is learning to use a tool and it’s not just about coding. I worked as a Software Engineer at Reuters in a small R&D team that programmed the Reuters Business Briefing products for web. When I say a small team, although there were only 3 programmers the real team was much larger. Working with us was a team of branding experts, User Interface designers, SQA testers, System Administrators, enterprise network architects, operations deployment engineers and product managers. If you read back that roll call that worked to deliver what became an award winning product, the number of people writing code was pretty small. The majority of the jobs on a technical project were clearly not programming. Though, if you talk to the majority of programmers they’d tell you that they’re doing most of the work. But we’re slightly biased! 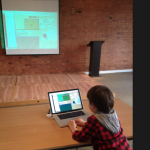 This is where the educational aspect of Computing beyond coding can have a real impact. 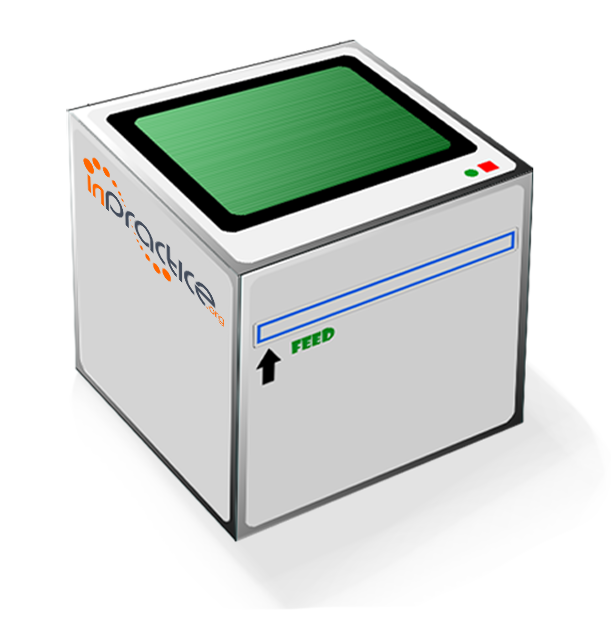 There are many great, interesting, important, jobs building products that don’t involve any coding. But what they all need is a solid understanding of Computing. Why? Because if the research is correct, the next 7 years will see a massive amount of opportunity for our children if they’ve got the correct skills. Something unexpected happened during our week at GameCity running the Craft Computer workshops. We didn’t stop! I want to build a computer! was the surprising response most children had when they saw us. I was expecting a curious few to attend but we had a lot of very happy excited children sat with us building computers, learning about pixels and art for pretty much the whole time we were there. In fact, during the first day I was literally hidden away in closed off room on the fifth (top) floor of Waterstones and we still had a continuous stream of visitors. Every single one had come specifically as the children wanted to build a computer after seeing a write up in the event programme. Joking aside, it’s clear that there is a growing and real interest in this area from people that might ordinarily see this material as out of reach but craft makes it accessible. And it’s more than just code clubs too. 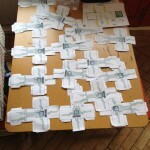 Craft approaches and the Internet of things promises to provide tangible and fun material to play/learn with. Hackable Games, MicroTowns and the Craft Computer at GameCity. 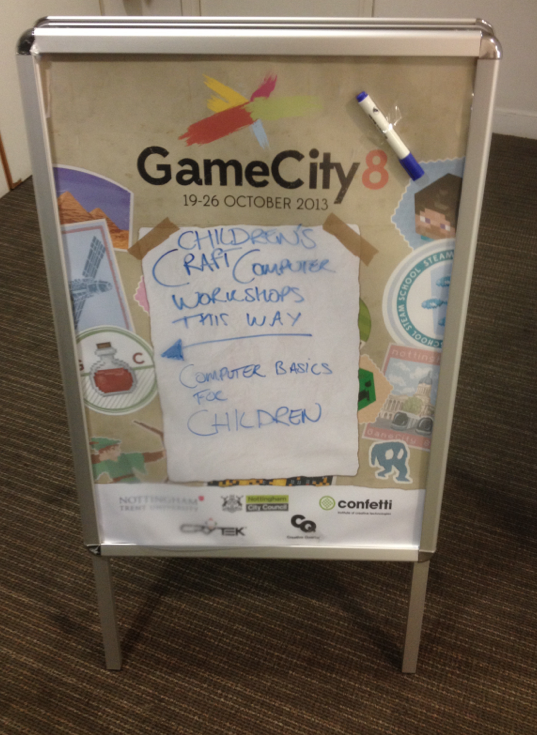 We’ll be running kids coding workshops at the forthcoming GameCity 8 in Nottingham from October 23rd to 26th. 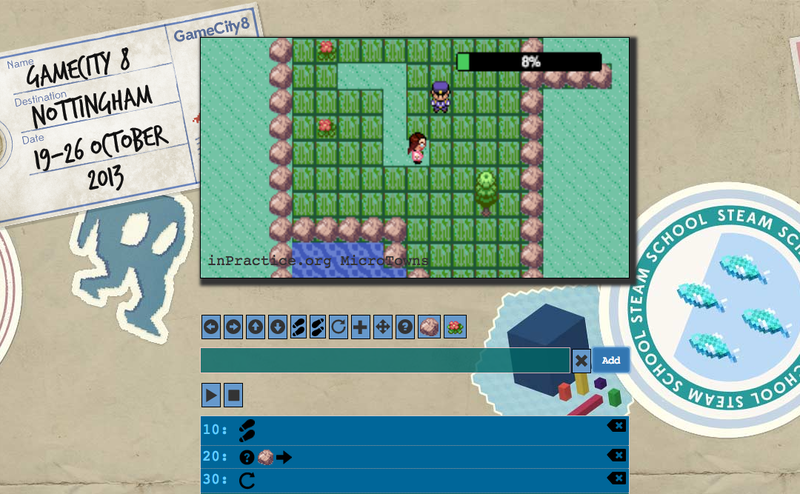 But even more exciting, we’ll be showing of our Hackable game MicroTowns for the very first time. I know! I can barely type for the all the hoopla. What’s a hackable game you ask? A hackable game is one that allows you to hack on the ‘code’ of the game while you’re playing it or running it. Aimed at children at Key Stage 1 and 2 (KS1 / KS2) ages we’ll be making Craft Computers to learn about the main components inside and some Computing fundamentals such as files and programs. After they’ve mastered their hardware we’ll let them loose on our MicroTowns prototype which will teach them the basics of Computational thinking and programming. 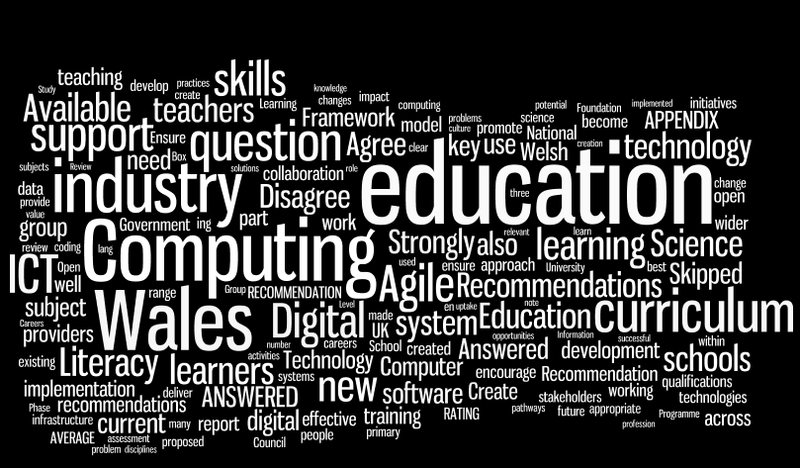 Last year Leighton Andrews’ Steering Committee set out to report on how to reform the ICT education in Wales. 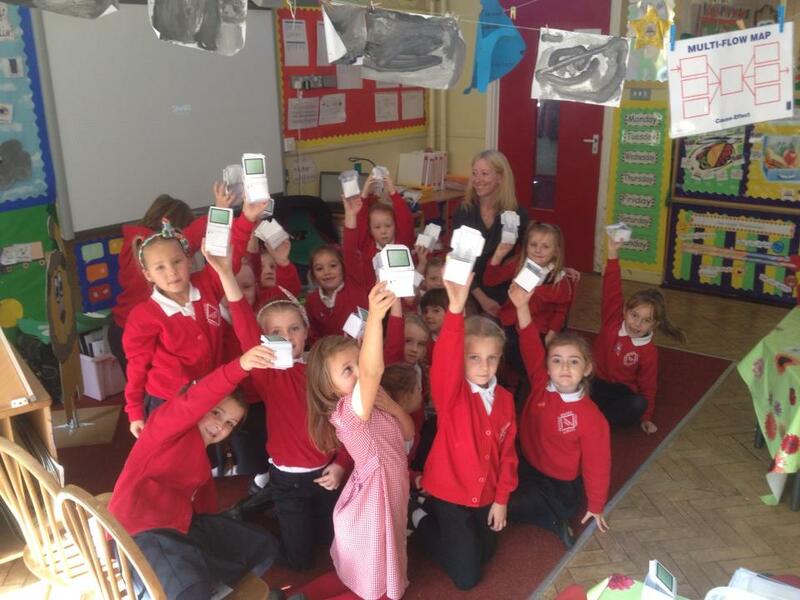 Their goal was to ensure every child in Wales is equipped to take advantage of our heavily technology centric world. The recommendations in the report are visionary, bold, relevant and importantly they’re achievable. 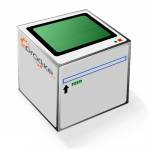 This is how we started to talk about memory and the file storage of a computer. I asked our group of 6 year olds to pretend that unless they had something written down they wouldn’t remember it. This, of course, was a source of much amusement to them. By the way, it still amazes me, that they’re only 6 years old. They don’t perceive things by varying levels of difficulty, just varying levels of interest/fun. This approach serves as a really fun way to talk about computers, have them role play and learn some high level concepts around the way computers ‘bootstrap’. 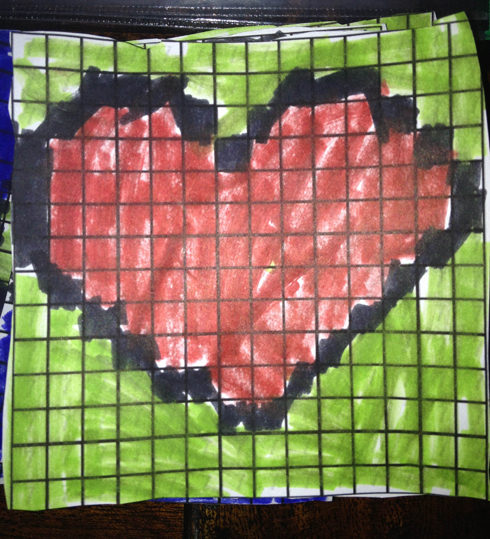 The pixel heart picture above is from the Craft Computer Kit (download link below) and it’s a black and white numbered grid. Each number corresponds to a colour e.g. 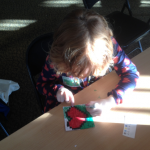 1 = Red and the children spend around 15 minutes colouring them in. They love this as a) they love colouring in and b) they’ve no idea what the picture is until about a 2/3 of the way through. They think it’s magic – which is a great jumping off point to explain, it’s not magic, but the way Computers work which is ultimately more exciting. 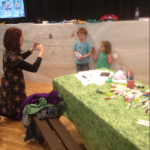 Weeks 2 and 3 merged and overlapped due to the role play, Q&A and the craft items which some of children were slower at. So my advice at this point on using the Craft Computer approach is to allocate more time than you think or be happy to have one week overlap with the next. I just wanted to share something I found today that really surprised me. The map shows the locations from which our Craft Computer Kit has been viewed or downloaded. 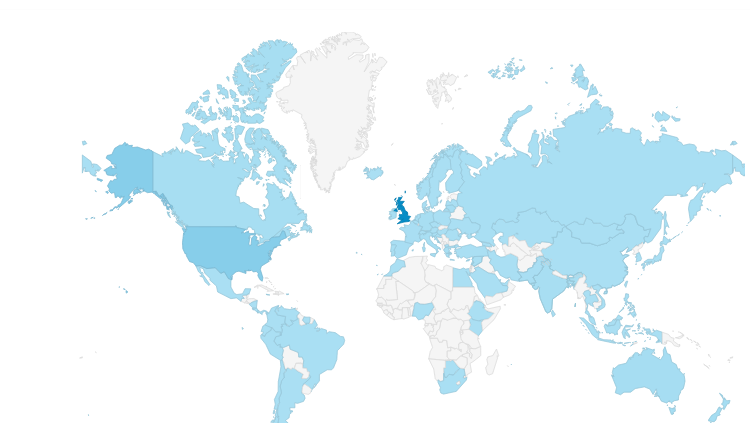 Incredibly, it’s been viewed from every continent – according to Google Analytics, not convinced about Antarctica yet! The darker the blue the more it has been downloaded. Understandably, the UK and US are the darkest but I’m really pleased to see lots from South America. Having spent a few months in Peru I know first hand how useful good education is. It would be great to see Africa showing up and we’ve some plans to help there. We designed the Craft Computer kit to help teach children Computational Thinking for ages 5-7 and 7-9 and the response has been terrific. I’m currently in my 3rd week of teaching a Computing lunchtime class with it and the kids love it – Week 1 Notes. This is what I’ve got running after Day 2. It’s a basic tilemap engine but today the sprites are programmable! Each sprite has a little stack and program counter which can be ‘hacked’. Like most of Jeff’s games, he takes a classic game mechanic and adds his own uniquely brilliant take on it. In this case, he takes Pac-man’s famous ‘visit all the locations” mechanic, changes the ghosts for a gardener and dots for grass. 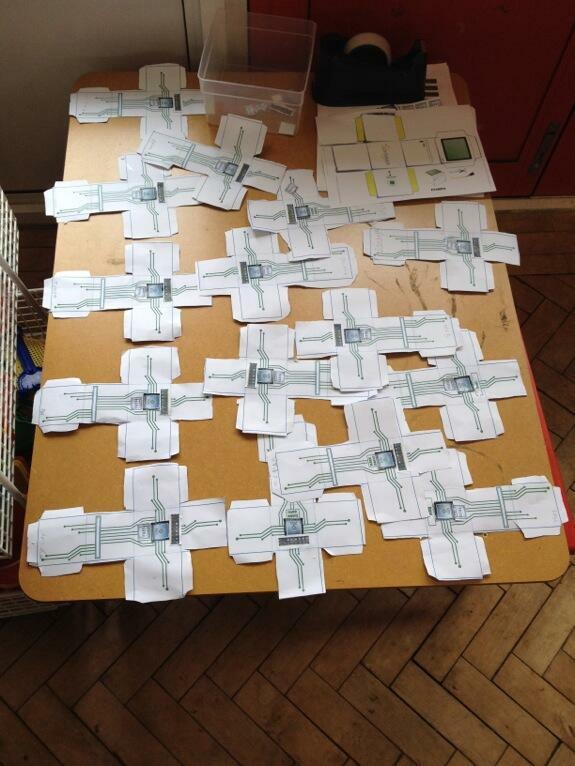 Instead the children will have to program the “mowbot” via an iconified programming language – a bit like punch cards! Rather than the procedural “route finding” approach we’re going to use an event driven language. If nothing else it should result in the kids having lots of garden based floral carnage! *Jeff and Llamasoft are still making games and are due to release TXK on the PS Vita shortly. He’s like the Game Industry’s Willy Wonka and if you’ve not played his games, you should go check them out – here’s his Llamasoft site. **GameCity: I’m going to be there from Weds 23rd to the end on Sat 26th, I’ll be at Waterstone’s running Craft Computer workshops. Step 2 – Components on the motherboard! For the past two weeks I’ve been teaching, in a South Wales primary school, a year 2 girls only lunchtime computing class (they’re mainly 6-7 years old – here’s the reason why girls only) and I’ve been using the Craft Computer PDF kit I made [you can download it here]. The material is based on the English KS1 National Curriculum – Wales is in the process of creating its own syllabus but I personally think the English is great, an immense achievement really, so we’re using that. As a quick gauge of how it’s going, the class is purely voluntary, parent’s have to sign a consent letter. The first week I had 14 girls and yesterday I had 5 new ones asking if could they join in! A big nod must go to their parents for agreeing and thinking it a worthwhile thing for them to learn. I wasn’t sure what resources the class would have – turns out it was 2 computers for 30 children! It gives everyone a simple, tangible, foundation upon which we can build throughout a series of lessons. My name is Dan and I’m a programer. My job is programming computers, does anyone know what a programmer is? What things can you do with a computer? This is a great question, as they’ll give you a ton of applications which you can use as solid examples later on such as: games, watch videos, write letters, draw pictures, make music, send photos, etc. This is a great area to expand into technology outside of school and digital safety/literacy later on.But for now, we’re interested in the nuts and bolts of what’s going on inside the machine. 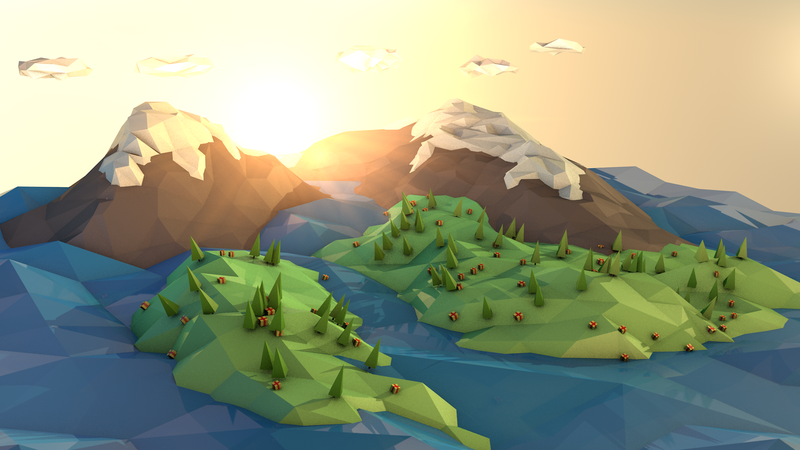 We use the children’s examples to reinforce the idea that with a computer you can pretty much do anything, it’s a tool to help you build, model and create to understand things. Once I felt they were comfortable with the notion of computers as tool, I asked them if they knew what might be inside that could do all these things? What do you think is inside a computer? This is where you get to hear lots of amazing and funny answers: lightning, electricity, batteries, pictures, tiny wheels! At this point I ask them who wants to build a computer and see what’s inside and naturally you get a room full of excited children. Awesome! 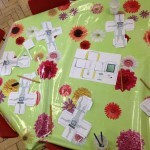 We then decamp to the craft tables where each child has a pair of scissors, some glue and the craft computer templates – which looks like this! Once they’ve cut out their templates we then talk about the the 3 main parts of the computer: the cpu, the memory and the storage. I tend to use a lot of brain/memory analogies which is a little fuzzy (i.e. our brains are a mixture) but it works well enough. The files (storage) is where the computer writes everything down so it can remember things for next time when it’s turned off. We finished with recapping the main points of what computers can do, how they do it (i.e. programs) and what’s inside.